BELO HORIZONTE: Tournament sensations Costa Rica drew 0-0 with England in Belo Horizonte on Tuesday to top World Cup Group D unbeaten and leave their winless opponents bottom of the table. The Central American outsiders had already defied the tag of minnows to record stunning wins over both Uruguay and Italy, taking them into the last 16 for the first time since their maiden World Cup in 1990. The draw against England allowed them to secure first place, while Uruguay seized second spot with a 1-0 win against 10-man Italy in Natal. "We're very satisfied," said Costa Rica's Colombian coach Jorge Luis Pinto. "England are one of the main teams in the world. They're real champions, so we know it'd be a difficult game. We were able to get a point. "I thought it was a very even game. We have proved we can play good football and this makes me feel proud." Sixty-four years on from their humiliating 1-0 loss to the United States in the city, a youthful and much-changed England side were unable to restore pride after their earliest World Cup exit since 1958. Manager Roy Hodgson made nine changes to his starting XI, notably handing first competitive starts to 18-year-old Luke Shaw and 20-year-old Ross Barkley, but his side laboured in the Estadio Mineirao sunshine. Hodgson, however, struck an upbeat note, saying: "Apart from the first 10 to 12 minutes, we dominated totally. "We didn't take our goal chances. If we did, we would have comfortably won. We created the chances and that's important. "I thought we were really unlucky not to win this game. I thought the whole back four was absolutely excellent. We restricted the team to almost no chances. In midfield we dominated and outplayed them." Further emphasising the mood of change for England, Frank Lampard captained the team and Steven Gerrard came on for what are likely to have been their final international appearances. But the day belonged to Costa Rica. Pinto's side had already qualified thanks to their wins over Uruguay and Italy and they can now look forward to a likely last-16 encounter with the Ivory Coast, whose group concludes later on Tuesday. 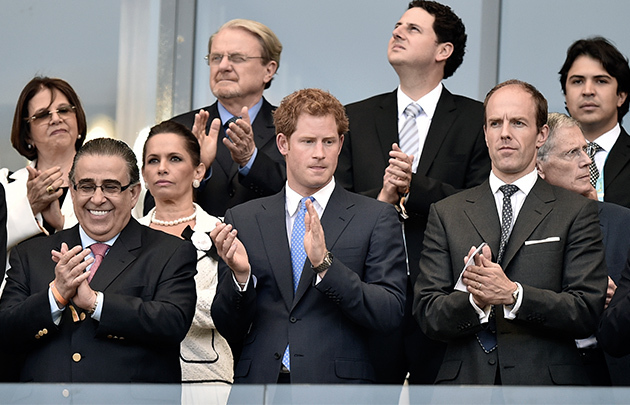 With Prince Harry, fourth in line to the British throne, watching from the stands, England's would-be footballing heirs looked to make an aggressive start, but it was Costa Rica who threatened first. Arsenal forward Joel Campbell's 20-yard dig took a deflection off Gary Cahill that sent it fractionally wide of the right-hand post, but no corner was awarded. Some of the Costa Ricans' interchanges conveyed the exuberance of a team riding the crest of a wave, but England began to make inroads, with Daniel Sturridge curling narrowly wide and thrashing a long-ranger off-target. Celso Borges then came within inches of putting Costa Rica ahead, only for England goalkeeper Ben Foster -- making a first competitive start since 2009 -- to brilliantly touch his 25-yard free-kick onto the bar. England finished the first half brightly, Sturridge heading over and Barkley blasting wide, but there was little tempo to the game. The torpor persisted in the second period and England's technical deficiencies continuing to dog them, with Sturridge's poor first touch after a Shaw shot had ricocheted into his path allowing Costa Rica goalkeeper Keylor Navas to make a brave save. When England belatedly produced a moment of quality, Sturridge initiating a smart one-two with Jack Wilshere, the Liverpool striker could only bend the ball wide from 10 yards. Hodgson sent on Raheem Sterling, Gerrard and Wayne Rooney as the game drifted towards its conclusion. Rooney saw a characteristic chip touched over the bar by Navas, but there was to be no late salvo from England, whose frustrated fans had to be subdued by riot police as the final whistle neared.